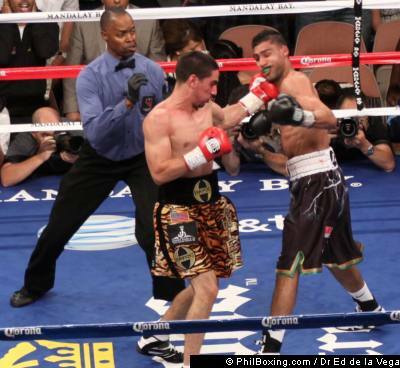 So many times you see a fight between two good fighters (Amir Khan – Danny Garcia, for example) taking place in a venue it has no business being in. Whether it’s the size of the venue, the city it’s held in, or both. As a result of this, again using Khan-Garcia as a prime example, you have a fighter from England (Khan) taking on a fighter from Philadelphia (Garcia) at the Mandalay Bay in Las Vegas. No local connection whatsoever, no large crowds breaking down the doors for a chance to see a talent rich Amir Khan taking on a fighter that the laymen couldn’t pick out of a lineup (Garcia). Common sense leads you to believe that this particular fight should have been held in Atlantic City, the Theatre at Madison Square Garden, or in England. Those venues would have yielded far better sales. for a gate $426,150. The problem with those numbers is that in addition to the tickets sold, 737 were left unsold, 3,364 were comped (free) and the gate for the event was less than the purse for either fighter (Khan made $950,000, Garcia $520,000). Doesn’t seem like good business sense, does it? To actually give away, for free, more tickets than you sold for the event just strikes me as, well…stupid. Placing a fight in Las Vegas should almost strictly be for big time, big money fights. Everything else is basically a let down. Amir Khan’s promoter, Golden Boy Promotions (GBP), showed extremely poor foresight when planning out the city/venue for this fight to take place. I’m not jumping on GBP alone. Many other promotional companies hold fights between fighters with little build up and place the fight in Vegas or some other location with bright lights and avoid placing the fight where it should be because they are blinded by shiny things. Main Events has Tomasz Adamek as one of their main event fighters (no pun intended). Adamek is from Poland and lives in New Jersey. When Adamek is in the main event of one of their events they place the card at the Prudential Center in Newark, NJ, a city with a large Polish population. Adamek draws large crowds in New Jersey, so that’s where they put him to fight. It makes sense. Top Rank puts Julio Cesar Chavez, Jr. (a Mexican) in Mexico and Texas. It makes sense. Maybe Golden Boy overestimated Khan’s star power? Maybe they thought the British throngs would fly over to see one of their own, as they are known to do? Whatever the reason, it was not well thought out. If a fight is placed in the right city/venue/section of the country (and at a semi-reasonable price) people will come to watch. Hell, you might not get a sell-out, but you won’t be giving away more tickets than you sold for the fight, that I promise you.